There's something called MonoGame that may allow XNAWhatever to be ported. Not sure -- they haven't built it for Mac for awhile. I did some artwork - more info here. 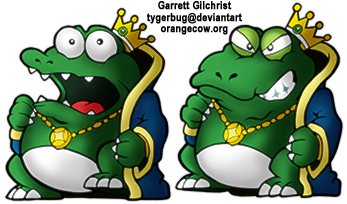 Sednaiur has done some large-scale (2X, 4X) characters for the Super Mario Bros games, in All Stars style, with lots of expanded graphics and variations. Shonumi's Game Boy Enhanced emulator project can replace graphics in Game Boy games. Excellent news, thanks for sharing! Isn't that great? This should make colorizing Game Boy games relatively straightforward. Glad you like the idea behind GB Enhanced! You can thank AnyOldName3 for suggesting it; the concept intrigued me. I actually stumbled upon both projects (HiSMS, HDNes) a few months back. Looks like I'm not the only one who had that idea. Fwiw, there was a proof-of-concept GB emulator that did allow HD tile replacement, but it was incomplete (and I don't think it handled colorizing DMG games). I'm not exact the first when it comes to the GB, but I guess I've gone the farthest. GB Enhanced only handles 1:1 tile replacements, but support for arbitrary scales (2:1, 3:1, 4:1, etc) is already implemented in a new branch. There are still some finishing touches that need to be applied, but it works. GBC tile replacement isn't supported yet, but that's coming soon. A shame I don't have screenshots on hand to show you any progress. Mkwong98, thank you for the HDNes Super Mario Bros sprite information. The way you've organized the HD version is very straightforward and will make replacing the graphics simple even though I can't run the program on my Mac. 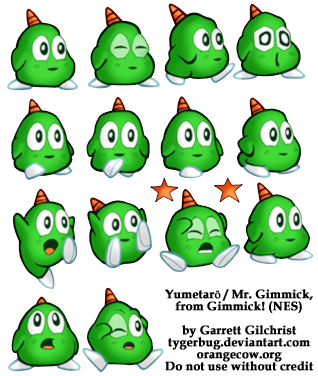 Let me know if you have/can do any other organized sprite versions, like SMB2 and Mr. Gimmick and so on (Mega Man, Rescue Rangers). I did some sketches of the SMB and SMB2 Mario Brothers. SMB2 is much easier, despite the two-frame walk cycle - they look like the current Mario Bros. 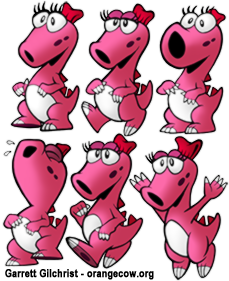 The three-frame walk cycle is pretty confusing in SMB1, and his design is different enough from the current Mario that it's going to take some thought. Jinn.art.br did a really nice "darker" take on SMB1, so I've asked him to have a look at this, as that's probably the right way to go. For SMB1, use the SMB3 design and expand the walk to six frames. That's pretty much what All Stars did, although I think it'd still be possible to get closer to the SMB1 sprites while still making it "look like Mario." Jinn had a very interesting idea on how to approach it - ignoring the other games and going for a different style. I've asked him to take a look at things. Looking nice. Now all someone needs to do is draw Cloud Strife from Final Fantasy VII with George W. Bush's head. You can't unsee it. it's a really good emulator. 1. Fixed a bug when removing redundant screen shots used by the graphics pack editor. 2. Compiled the emulator with SSE. 3. Reduced the amount of rendering by keeping graphics data from one frame to the next. Large speed improvement when using 4x graphics pack in games with many unique tiles appearing at the same time on the screen but do not vary a lot between frames. For example the title screen of Dragonball Z. Does this emu have flicker when playing NES games with their original graphics, like all other emulators? If so, would it be possible to add a mode in which the emulator automatically uses the game's original tile set *as if* it were an HD graphics pack, so as to eliminate flicker? I'm not really interested in HD graphics, but to be able to play NES games with their original graphics and no flicker would be quite revolutionary.